On 19 June 2017, the Eastern Partnership Civil Society Forum participated in the Eastern Partnership Ministerial Meeting in Luxembourg, represented by Hennadiy Maksak, Co-Chair of the EaP CSF Steering Committee. 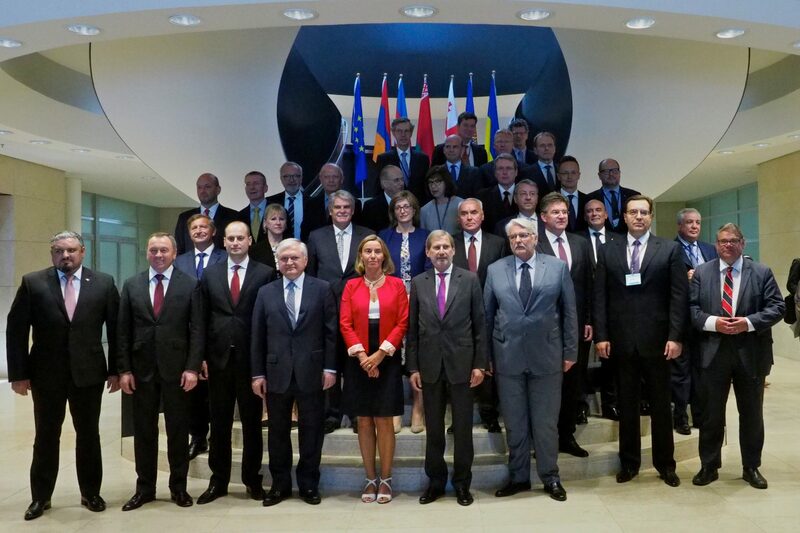 The meeting, chaired by the High Representative of the Union for Foreign Affairs and Security Policy Federica Mogherini, gathered all EU member states’ Ministers of Foreign Affairs, Ministers of Foreign Affairs from the six EaP countries and EU officials, including Commissioner Johannes Hahn (European Neighbourhood Policy and Enlargement Negotiations). In his address, Hennadiy Maksak welcomed the recent efforts to further develop and refine the Eastern Partnership as a comprehensive policy. Likewise, he welcomed the enhanced role of the civil society in shaping the Eastern Partnership’s goals and its recognition as a cross-cutting element in the Joint Staff Working Document “Eastern Partnership – 20 deliverables for 2020”, while underlining its important role in communicating with citizens of the respective countries to bring the policy closer to them. The Co-Chair of the EaP CSF SC also emphasized the role of CSOs as active actors in the implementation of reforms together with the respective governments and called for a greater involvement of the Eastern Partnership Civil Society Forum, particularly in policy-making. This is possible thanks to the instruments at disposal of the Forum, such as the EaP Index and ad hoc monitoring missions, which have proved to be effective in providing assessment of the situation on the ground. Hennadiy Maksak also pointed out the positive developments from the first half of 2017, especially the visa-free regimes granted to Georgia and Ukraine, the newly initialed agreement between the EU and Armenia, as well as the negotiations on the new agreement with Azerbaijan. However, he also voiced the concerns of civil society about the political and economic control exercised by the Russian authorities in the EaP region, and reminded that millions of citizens in the EaP countries still do not enjoy the human rights and democratic values on which the Eastern Partnership has been built. Having raised a number of critical points, Maksak called on EaP countries’ authorities to address the most important issues in their respective countries, and appealed on the EU institutions to keep the EaP policy at the top of its agenda, as well as to contribute to the stability of the EaP region, crucial to the stability of the EU itself.